Plot: After terrorist attacks are carried out by a neo-Nazi organisation, Bond is called in to create an investigative team - consisting of agents from Britain, America, Israel, and Russia. James Bond has never been on a mission like the one described in Icebreaker, not in the best-selling License Renewed, not even in For Special Services. Posted by M to the freezing forests of north Finland in winter, the indomitable 007 is obliged against his better judgment to collaborate with fellow agents of the KGB, the CIA and Mossad (the Israeli Secret Service). Their task: to discover, fix and, if feasible, eradicate a secret neo-Nazi core group whose worldwide terrorist activities have reached alarming proportions and whose headquarters, the Ice Palace, may well be across the border in Arctic Russia. Right from the start, Bond senses that things aren't what they seem. First there is Paula Vacker, Bond's old Helsinki dalliance. But if Paula is a dalliance, why are two knife-wielding professionals waiting for Bond in her apartment? And why the three giant snow plows, lying in ambush on the frozen nocturnal roads of the North to make a sausage of Bond's Saab? Then there are his mission partners: Kolya Mosolov of the KGB, the chameleon of a thousand faces; "Bad" Brad Tirpitz of the CIA, given to calling a spade a shovel, who trails Bond's snow scooter in one of his own; and Rivke Ingber of Mossad, whose wiles and beauty entice Bond to one of the rare blunders of his career. Behind them all lurks the mysterious Count von Glöda, he of the Nazi calling, deviser (among other things) of the ice torture, as deadly a power as Bond has encountered. For, unknown to Bond, von Glöda has made a pact with the KGB. Von Glöda's part of the bargain? To deliver James Bond - alive is possible! The heirs of SMERSH, it seems, have long memories indeed. James Bond, like Sherlock Holmes before him, has become a myth of the twentieth century. Predictably, when John Gardner (under copyright licence) first brought Bond into the 1980s with new consciousness of health and ecology, a change of car and a passing nod at feminism, his book, Licence Renewed, went straight to No. 1 on the bestseller lists on both sides of the Atlantic. Fleming himself 'would not be displeased', the Daily Telegraph said. A second updated Bond adventure, For Special Services, enjoyed an even greater success, remaining for months on end on bestseller lists in America. Now, indestructible as ever, Bond is back in a third assignment from John Gardner - a deadly assignment undertaken in cohort with Bond's opposite numbers from the United States, the Soviet Union and Israel in the desolate Arctic wastes of Lapland. Yet if resurgent fascism is the common enemy, who is really to be feared? Can SMERSH be trusted to resist the temptation to seek vengeance on Bond? Is it the breezy American or the voluptuous Israeli who is acting as double agent? Are the Finns merely using Bond to break the KGB's stranglehold on their tenuous national autonomy? Never has Bond encountered such an unnervingly deceitful hunch of collaborators or been subject to such a bewildering series of potentially lethal shocks. Top Left: British 2nd edition Coronet paperback (UK). Top Right: American 1st edition Putnam hardback. Bottom Right: American 1st edition Berkley paperback. I would like to thank those who gave invaluable assistance in the preparation of this book. First, to my good friends Erik Carlsson and Simo Lampien who put up with me in the Arctic Circle. To John Edwards who suggested that I go to Finland, and made it possible. To Ian Adcock who did not lose his temper, but remained placid, when, during a cross-country ride in northern Finland - in early February 1982 - I took him, not once, but three times, into snowdrifts. My thanks also to that diplomat amongst Finnish gentlemen, Bernhard Flander, who did the same thing to me in a slightly more embarrassing pace - right on the Finnish-Russian border. We thank the Finnish Army for pulling us out. Acknowledgments would not be complete without reference to Philip Hall who has given me much support throughout. "From time to time he had worked in conjunction with another member of either his own, or a sister, service. But Icebreaker was different. Now he had been forced to act with a team and Bond was not a team man - especially not a team that blatantly contained grave elements of mistrust." James Bond faces a villain with an ice palace in "Icebreaker", much in the same vein as the cinematic 007 in "Die Another Day", almost 20 years later. 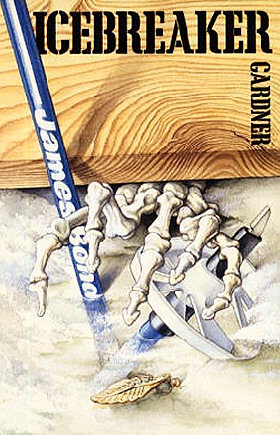 One version of the cover art was also echoed in the 20th James Bond film teaser poster with an image of a gun resting on ice. Icebreaker begins when 007 stops off in Helsinki to visit an old (but still stunning) flame, Paula Vacker. However, despite Bond arriving with no notice, he still has to deal with two thugs who were awaiting him. M then calls Bond to London, where he is briefed about Icebreaker, a joint operation against the National Socialist Action Army (NSAA) who are a dangerous neo-Nazi group, whose suspected leader is Count Konrad von Glöda. The NSAA is being supplied with weapons from Alakurti, a Russian station in the Arctic, and Bond accompanies Mosolov of the KGB to seek proof. Brad Tirpitz (CIA) and Rivke Ingber (Mossad-Israeli intelligence) are assigned to help Bond, but after 007 is almost killed by snow-ploughs, Rivke is injured after being revealed as Anni Tudeer, daughter of an SS officer. The remnants of the increasingly disunified Icebreaker group continue, but Tirpitz is caught in another explosion and Mosolov leads Bond into an ambush as they seek out von Gloda�s hideout on the Russian-Finnish border. Paula then turns up and takes Bond to von Glöda, who it turns out Tirpitz is working for. Bond will be handed over to the former SMERSH. However, everyone starts double and triple-crossing each other. Mosolov�s Russians blow up Glöda�s HQ but the Count escapes. Bond and Paula (really a Finnish intelligence officer) make it to Helsinki, where Bond kills Mosolov, then deals with von Glöda before he can leave the country. Tirpitz turns out to be a CIA agent after all.